I am at verge of calling Vertigo the definitive "guy" flick, providing said guy is of intensely romantic bent and subject to obsessions not unlike ones Scotty experienced. Do women dig Vertigo? Not ones I've spoken with --- Ann barely recalls our watching beyond dismissal of it as lesser Hitchcock (Rear Window's her idea of great, a sentiment shared by '58 exhibs). Does Stewart/Scotty creep out distaff viewers? It might me were I female. 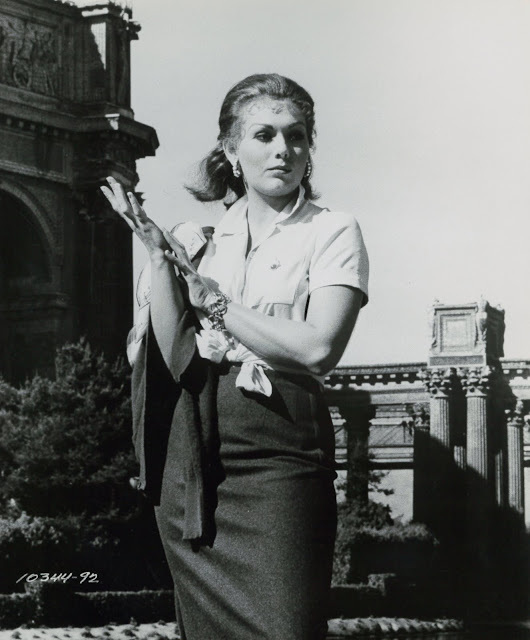 Lest we forget, "apt pupil" Judy falls only after Scotty drags her up the bell tower stairs. Now, there are certain men, lots I suspect, who see themselves in Scotty. I heard from a few by e-mail since last week's Part One. What they shared was too personal to include among comments, but rest assured, their identification with "Old Available Ferguson" was intense. One calls Vertigo simply the finest motion picture ever made. Obviously Hitchcock glimpsed Scotty in mirrors more than once. Did he sense as much in all us males watching? 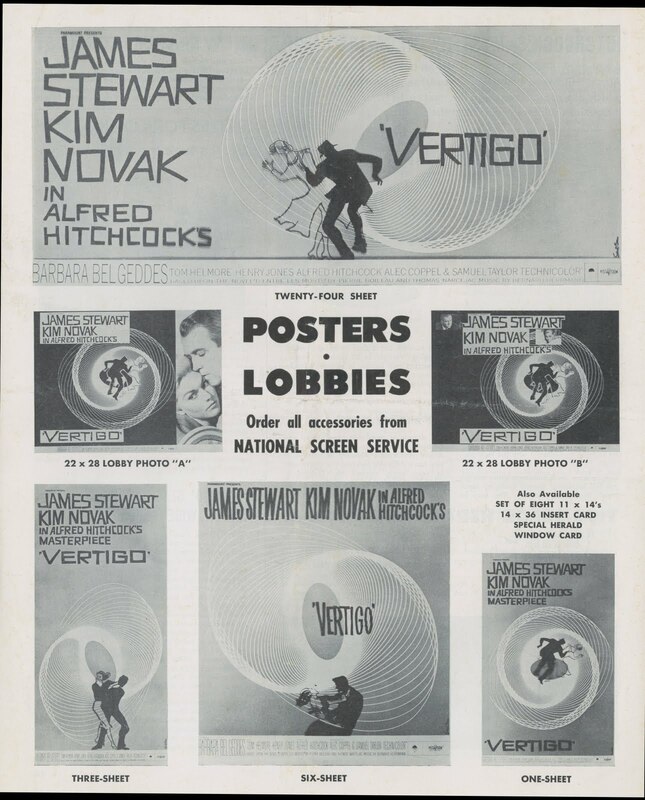 There's an extra on Universal's DVD that could change, if not wreck, our perception of Vertigo were it appended to circulating prints. Hitchcock was Code obliged to film a tag-on indicating dragnets, in Europe no less, about to close in on Gavin Elster. The news is broadcast via Midge's apartment radio, she and Scotty splitting a bottle post-Judy plunge. It's a near nothing of less than two minutes, but plugged-into Vertigo, then or since, would lay waste to much of the film's impact and legacy. The fade as it stands leaves Scotty atop the bell tower, our impression being he'll not recover from this trauma. But the coda (did Hitchcock even direct it?) suggests SF will bounce back. There's even a comic tag to the newscaster's report. Fortunately, the scene was never inserted to release prints. I'm guessing Paramount and Hitchcock used what muscle they had (considerable) to keep it out, for which we can give thanks, even if it means Gavin Elster may still be living it up somewhere on the French Riviera (in John Robie's former villa, perhaps?). The ideal of romance, be it man or woman's, doomed or otherwise, is best exemplified by Bernard Herrmann's extraordinary music. We may argue Vertigo's merits till cattle come home, but votes are unanimous to place his among all-time greatest scores. I'm listening now, in fact. A big reason lots (inc. me) repeat view Vertigo is Herrmann. Had Hitchcock forecast same, he might have fired the man a lot sooner than Torn Curtain. Alf didn't like any collaborator becoming indispensible. Writer John Michael Hayes found out (via pink slip) shortly prior to Vertigo. Frank Capra's One-Man, One-Film mantra was one AH applied like a club, this an aspect of the Master's ego that would cost him dearly. 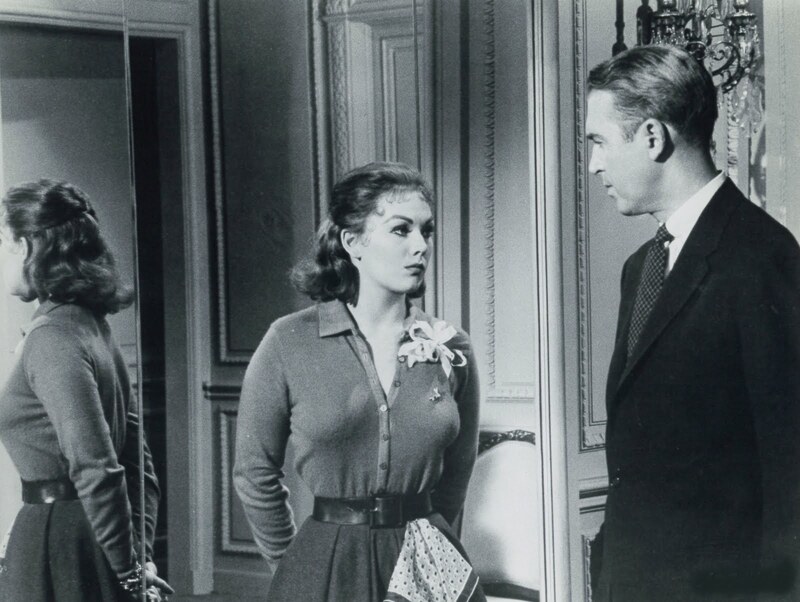 To take Herrmann away from Vertigo is to lose half (at least) of the pic's value. His score is that crucial, and Hitchcock of all participating had to know it. The costing dearly part would come with Torn Curtain in 1966. The story of Herrmann being dismissed and his score thrown out is a long one and needs not recounting here (better told elsewhere). I'll digress by mentioning that sequences from TC were rescored with Herrmann's music for a DVD extra. For those fourteen or so minutes, Torn Curtain suddenly (and finally) became a good movie for me. I ask some of you filmmusic experts out there --- could Torn Curtain be fixed with a complete overlay of Herrmann substituting the John Addison music used for release prints (and subsequent videos)? I read BH's music extended to the bus sequence, which is most of the way in. Could themes from his score be reprised to fill in the rest? Surely a Herrmann-devoted arranger/conductor could step up and, at long last, repair Hitchcock and Universal's misstep of 1966. If an Orson Welles memo could revitalize Touch Of Evil after so many years and be warmly received for the effort, couldn't restoration of Bernard Herrmann's score (a great one, and largely unheard beyond a few soundtrack CD's) do as much to rehabilitate Torn Curtain's standing among Hitchcock's late-career output? But back to Vertigo and Hitchcock's not-always infallible judgment. He was bullish from the start on a one-word title after fashion of prior Notorious, Spellbound, etc. Vertigo's shooting moniker, From Among The Dead, wouldn't do because, said Variety, (Paramount's) sales department isn't keen on the word "dead." One word is easier to remember, added Hitchcock, and it's easier for the marquee. As to fitness of Vertigo besides, it really doesn't make too much difference whether the title has anything to do with the story (Hitch evoked all-time hit, The Four Horsemen Of The Apocalypse, reminding trades that people still don't know what that means). 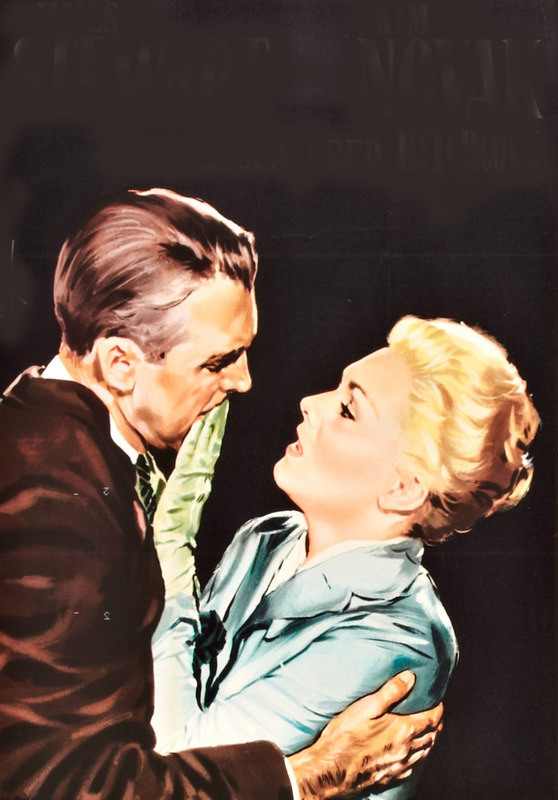 Influenced by recent success of theme song placement, the director pursued "a big piece of good will" by way of a title tune for Vertigo. Did Bernard Herrmann ultimately talk him out of what (we now know) would have been a serious bungle? There would be a Vertigo vocal, thankfully not heard over finished credits, Billy Eckstine the warbler selected (it's on a few CD's). A soundtrack LP was issued, plus another single, featuring Herrmann's music --- Love Music From Vertigo (gets best results from late-hour deejay programmers, said Variety's "Jocks, Jukes, and Disks" columnist) and on the flip side, Vertigo Prelude, which the reviewer called not as effective. Still, I'd have welcomed drifting off with either to AM slumber back in 1958. There are collectors still who prize these undoubtedly rare discs. 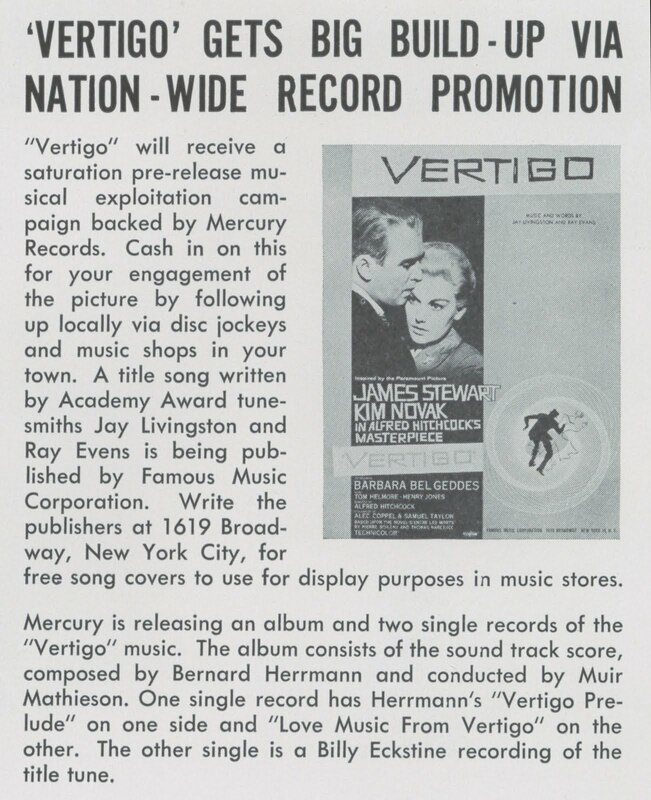 I recall the original Vertigo album being quite sought-after during years before re-recordings of the score became available. Does Vertigo's vintage vinyl still command premium dollars? 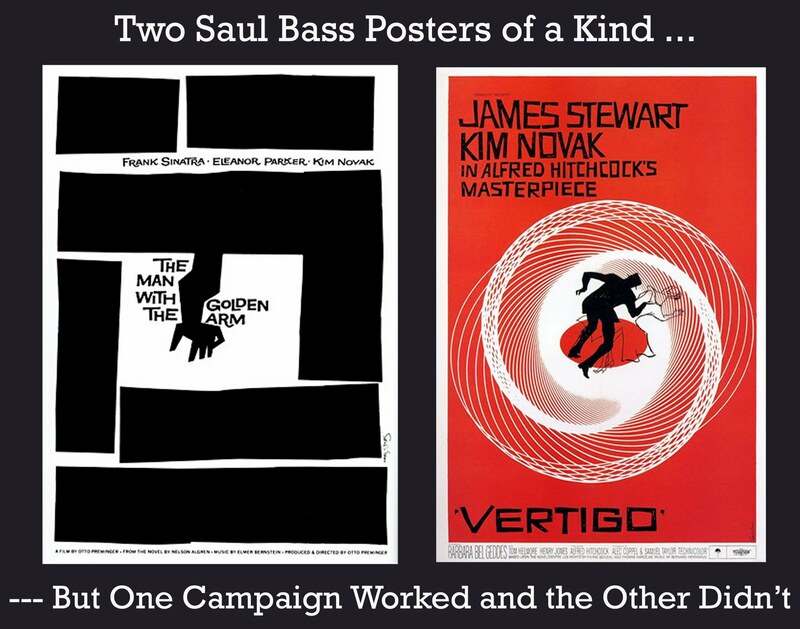 One thing Hitchcock insisted on was Saul Bass-designed poster art to promote Vertigo. Swirling enigmas these were, minus art of stars Paramount paid hefty for, so what folly was this anti-merchandising? Para had lately moved its sales division to the west coast and that much closer to Hitchcock's hands-on supervision. Wariness over ads too arty, plus drab in the bargain, pitted sale reps against AH well before Vertigo's May 1958 opening (not a few considered the film "somewhat handicapped" by the title Hitchcock had selected). But what if the director was right for following unconventional example of recent hit The Man With The Golden Arm, its poster also designed by Saul Bass and very similar to one-sheets forthcoming for Vertigo? Time, and reaction at turnstiles, would soon answer that riddle. Part Three and Conclusion to Vertigo Coming Next Week. I'm curious...A good friend once asked me who played Hayley Mills' sister in THE PARENT TRAP. Wonder if folks circa 1958 were asking similar question about VERTIGO? I always wonder what Alma thought of this one. Hitch mentions the end scene w/ Midge in the Truffaut interviews, but i didn't realize it'd been shot. Maybe it was important to Hitchcock that Scotty's failure in the case be absolute, stripping him of his professional competence on top of everything else. One more thing: When you mentioned a "Vertigo" vocal I immediately flashed on Mel Brooks singing "High Anxiety." But even that parody pales next to "Voyage to the Bottom of the Sea," a straight love ballad which actually opens that cheesy delight. I still prefer Hugo del Carril's MAS ALLA DEL OLVIDO. I always figured that Gavin was allowed to go unpunished was because the plot had become so convoluted by the end that everyone forgot about him. I took my wife to see Vertigo at the Ziegfeld Theatre in NYC during its anniversary run. She found the movie really creepy. The scene with Stewart trying to remake to Novak more to his liking was particularly sick, in her opinion. She even thought the opening credits were physically uncomfortable to watch. I've shown my daughter (now 15) many Hitchcok movies. She's enjoyed them all, but I'm afraid she'll have to discover Vertigo on her own. It's too strange, too intense unless you've lived a life a little bit. I didn't "get" it until I was in my 30s -- and by then I'd already seen it three previous times. The coda was required by the British censor.The scene might even be an outake with the radio announcement dubbed in later. Vertigo works a unique spell on those who love it and except it for the deception it is..I'm like Scotty..I return to it again and again,hoping Madeline will be true..hoping things will somehow turn out different. Your thoughts about Bernard Herrmann are very interesting. I believe Herrmann gets screen credit right before Hitchcock in Psycho. Hitchcock knew how important he was. 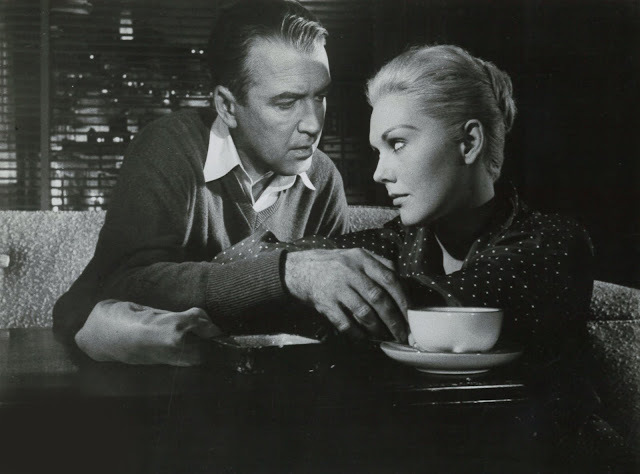 Vertigo is not a perfect film, but Herrmann's music really pulls it through during the slow spots. A good deal of "Torn Curtain" was actually recorded by Herrmann prior to the famous confrontation on the recording stage between Hitchcock and himself. However, I don't imagine it adds up to enough to supply the soundtrack with everything he'd written for the film. All tales agree he was interrupted and unable to record the entire written score. However, the entire score has been performed and recorded first on vinyl record and later on CD a couple of times, formerly by Elmer Bernstein (nearly complete), and latterly by Joel McNeely (everything.) 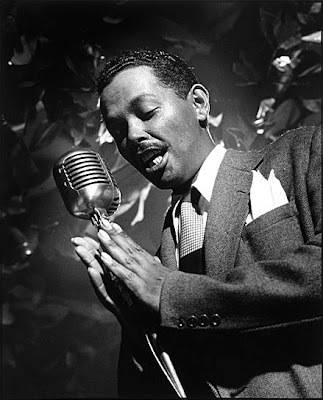 There are to my mind two obstructions to replacing the existing score for "Torn Curtain", which is to say the second one by John-He Got an Oscar for "Tom Jones" in '63-Addison. One is the fact that only those cues Herrmann himself recorded at Goldwyn before being canned by Hitch would presumably fit the timings of the sequences for which they were composed, versus the two commercial recordings which were of course both conducted 'wild', i.e., not in relationship to the film timings. The second is the fact that the presumably complete score as recorded the second time by McNeely for the Varese-Sarabande label also ends with a kind of somber music for the bicycling citizens. I've never been clear whether Herrmann never wrote anything more for the movie, which seems quite odd----not to have any music whatsoever in the final scenes and End Title----or, if these cues were lost somehow. Or----and this too seems absurd----was the score 'unfinished' at the first recording session, and Herrmann intended to complete the composition & recording of the score at some future date? That just doesn't make any sense, either. However, I think if and when (fat chance!) Universal ever contemplates issuing this enervating colostomy bag of a film on Blu-ray, they definitely SHOULD provide an alternative track with Herrmann's music dubbed in, in place of Addison's. This would be quite simple if they still have the dialog and effects stems, and as many of the cues Herrmann did 'lay down' on tape before "the incident". Finally, I totally agree with you that Hitch might have had his own agenda as far as beginning to sense and become sensitized to the fact that Herrmann's personality was becoming too apparent and worse, too responsible for too much that was compelling and interesting about his films. However, I also believe the standard version that MCA felt Herrmann was old school, overwrought (his music, let alone him personally! ), and becoming a liability versus somebody newer, more hip, and more in tune with the crap pop culture. 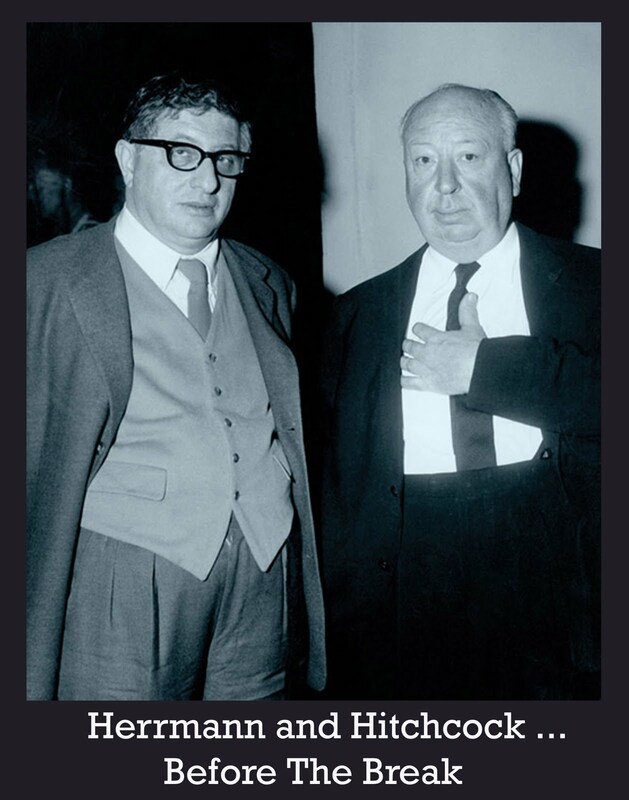 Of course Hitch's former agent was now the head of the studio----Wasserman. Wasserman was a big fan of Mancini, I know, and he might have had that talented composer in mind as a sort of prototype of who he thought the "new" Hitchcock---Universal's Hitchcock, in other words---should begin associating with. 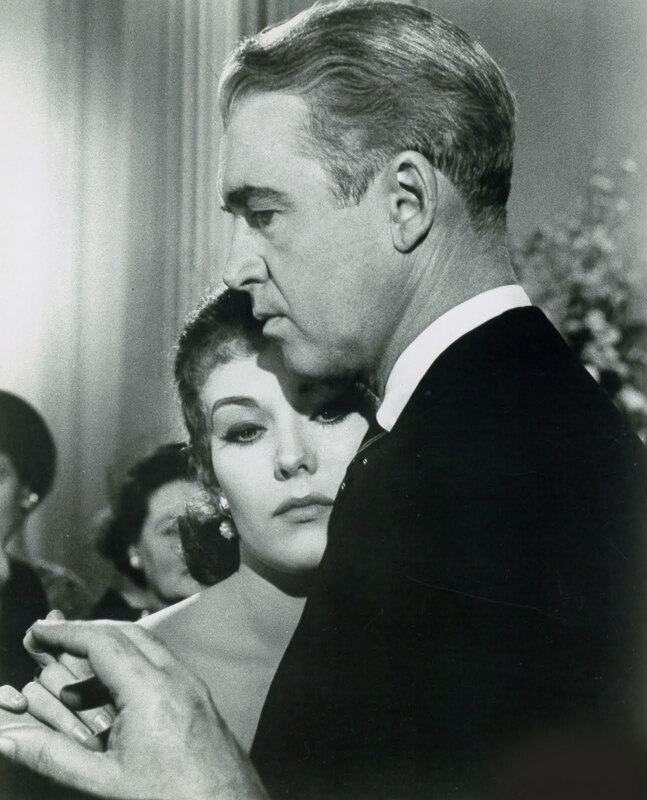 The massive irony is that Mancini DID score "Frenzy", and Hitch himself shot down the score, famously saying---and digging himself in even deeper----"If I'd wanted Herrmann, I would have gotten Herrmann." I've heard Mancini's excellent Main Title for "Frenzy", which he himself recorded during the last years of his life, and while it's moody and foreboding it's in his own style, not Bernard Herrmann's. John Williams---another kneejerk choice---did the last Hitchcock, "Family Plot", and like all Williams' work, and here I am very opinionated, I find it bland, and derivative of Herrmann in parts. All this is more proof if any more were needed that as far as musical scores were concerned, Hitchcock seems to have been out of his depth. But I do like your suggestion of Jerry Lewis in his prime playing the Jimmy Stewart role. "Oh nice lady with all the blonde don't do the thing of falling." Add me to the "'Vertigo' isn't Hitchcock's Best Film" chorus. Good film, yes, but overrated. It's hard to pick a best, but I'd say 'Rear Window','NBNW' and 'Shadow Of A Doubt' are three I'll never get sick of watching. When I took a class on Hitchcock, 'Blackmail'(the sound version)was a real revelation, worth seeking out if you haven't seen it. Love of the cinema and a sense of its history complicates my view of Vertigo. Whilst I can accept all the criticisms I also remember how captivated I was the first time I saw a faultless, flawless, sheer perfection presentation of the restored 70mm DTS version. I saw it again about two years ago at the NFT and parts of the print (probably the same one) were a little worn but for some reason I was no longer so swept up by the sheer 'live' experience of the extraordinary picture quality. What really spoilt the performance, however, was taking along someone without any sense of cinema who merely found it dated and boring. I sometimes look at parts of the DVD and am caught up each time. 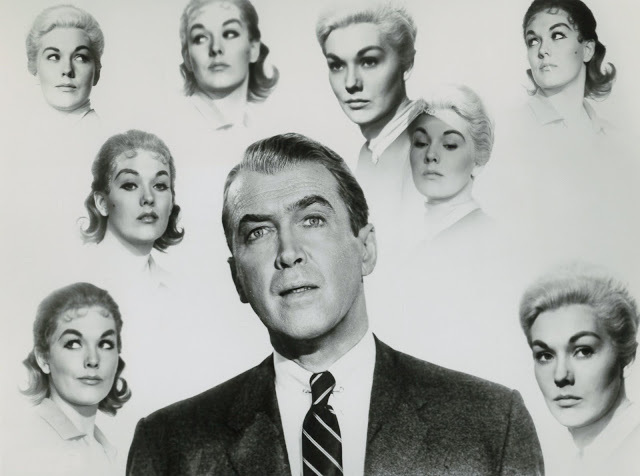 Well, I've known women who loved Vertigo because it creeps them out. (It creeps me out, too.) There's no nastier movie depiction of "nice guy" syndrome, and nastiness is what's called for. Even Notorious kept the nice guy safely on second fiddle while the sullen tough guy took romantic lead. Whereas Vertigo let the nice guy strut his stuff for all to see.